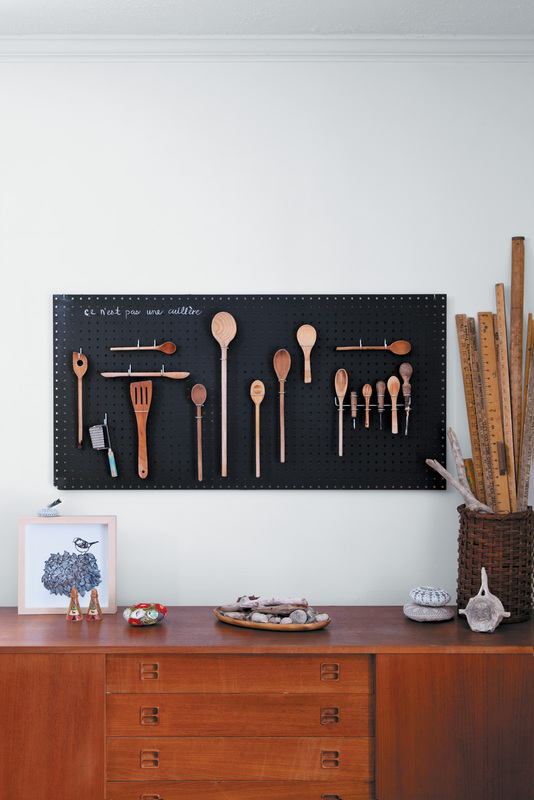 Margaret Oomen created the perfect pegboard sourcing inspiration—and a can of chalkboard paint—from the aisles of Home Depot. Two quick and cheap coats of chalkboard paint transformed the standard panel into a customized domestic exhibition space. Her spoon collection made its debut—“I love the contrast of the warm golden woods against the black”—but she plans on rotating the displays. “I’d like to mount antlers and bones I’ve found and sketch animals around them,” she says. “Or test it out as a seasonal light board; do dot-to-dot pictures; even experiment with a large-scale modern cross-stitch design using thick wool or jute.” You can’t always get what you want, but if you try sometimes, you just might find you get what you never knew you needed.